The first step is to plan out your design. We did this on some graph paper. EL wire is stiff and holds its shape but can't be bent many times or it will break (like any stiff wire). For that reason, you'll want to try to try and keep the wires on large flat surfaces or going around edges that don't flex. The nice thing about most laptop bags is that they have a flap and pockets with strong piping and corners to protect the computer, we'll take advantage of that! We're going to put a design on the large front flap, we'll start by chalking it out. Think about how you want the EL wire to travel around the bag. EL is hard to solder to, and harder to 'split' so keeping it simple is key! You'll want to have all the ends terminate near a pocket that will hold the inverter. Since the pocket AA inverters can only drive 2 or 3 meters or wire maximum, its smart to keep the design short and sweet. Keep track of how long the final wire will be, add up all the segments and keep the number under 2.5m for the best look. You can also of course use a larger inverter or two inverters! A half hour of planning now will make eveything easier later! Now that you have your pattern, its time to start working with the EL wire. If you've used EL before, it might be easier for you to cut EL pieces to match the traced out pattern. 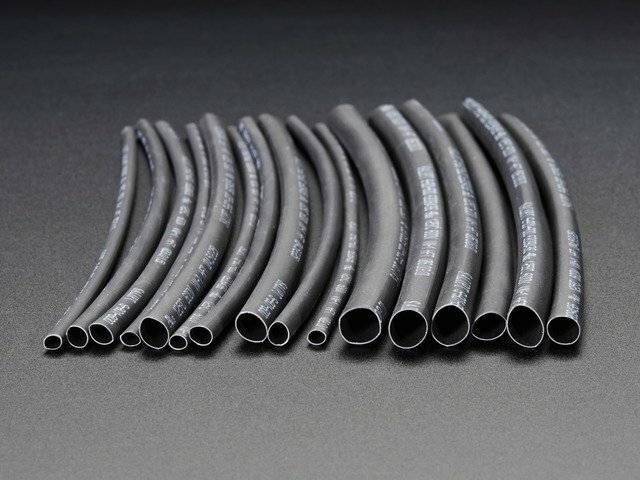 We're EL wire experts, but if you're still not really good with EL or if you're just starting out, don't cut any pieces yet! Instead, solder up one EL wire at a time and then lay it out and cut the ends. This is because it can take a few tries to solder to EL and every time you make a mistake you'll have to cut another 1 cm off and start over! Go over to our detailed EL wire tutorial (you'll want to keep it up on your web browser as solder all the pieces, and attach a connector so that you can connect it to the EL inverter. Once you've soldered your connector on, attach it to the inverter and test it, make sure the EL is glowing. Now disconnect the wire from the inverter - never cut EL wire while its lit! And don't cut it yet, we'll do that in a later step! Now we'll start sewing the EL onto the bag. We suggest using 'invisible' thread - also known as nylon thread, its strong and clear so that it wont distract from your EL. Place the inverter connected to the EL in the pocket you think is best, this will let you best judge how much wire you need - be sure to try opening and closing the bag so you don't make any mistakes. Its easy to cut EL wire down but impossible to make it longer so measure twice and cut once! Lay the EL wire so it traces the chalk outline (or piping) - in this photo the EL is lit but we don't necessarily suggest that you sew it lit unless it helps you visualize the design. Use masking tape to keep the EL wire in place. Use the needle and thread to wrap around the EL wire and tack it down, a stitch every cm is fine for long runs. We suggest grabbing plenty of material to provide a strong grip. You can cap the EL wire for protection with a piece of small heatshrink, while its still warm, squeeze it with pliers to seal it. We wanted to have a 'broken' wire detail in the center of the bag to match the TRON detailing observed in the movie. We did this by slipping some heat shrink over the EL wire to 'black out' the light-- much easier than trying to solder it to a short piece of wire. You'll want to cut the first piece a little long, again, and then solder two pieces of ribbon or other thin stranded wire to both the core and corona wires. Each one can go to another EL piece. This time, start sewing from the junction, so that its centered. Almost done! 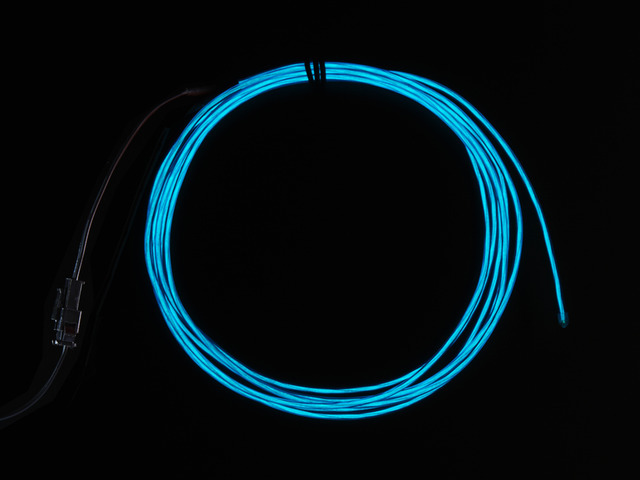 Once the EL wire is all sewn on make sure to test each strand again to make sure they are still strong and connected. Double check all the heatshrink as well. You can pass the wires around the bag or, if it is easier, and you're OK with permanent modification, punch a hole and pass the wires through it. This can be a little neater and less obviously modded. Finally we will connect the strands to the inverter. There are inverters that will 'animate' the strands but we like the 'solid on' look which also matches the TRON movie best. The only problem is we have 4 wires and we want to run them off of one inverter. We'll solve this problem by making a splitter, taking the one output of the inverter and allowing it to drive two EL wires. You can do this for as many strands as you'd like, just add up all the EL lengths. Solder and heat-shrink the wires. 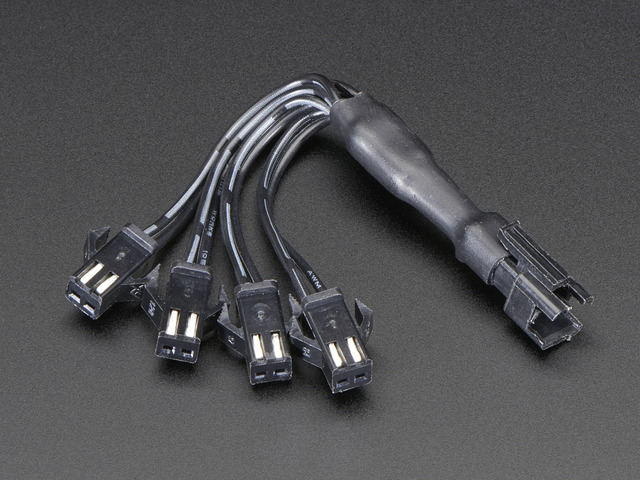 We also carry a pre-soldered four-way splitter for your convenience.